Almond smell, historical buildings and a trip to the past. You can have it all in a one day trip to Toledo, Spain. It was a Monday morning, we got up early, grabbed a coffee and went to the bus station. In our bag there was some water, biscuits, a camera and excitement. Destination: Toledo, the old Spanish capital. We got a metro to Plaza Elíptica (a station for intercity buses). To get there each of us spent €1,80 for the metro fare plus €9,96 for the return ticket to Toledo. The buses run every half hour until 9:30pm, and you can buy the tickets in the machines inside the station. Super easy, cheap and fast. The ride took just one hour and 15 minutes. Other option it is to go by train, there is a fast line (AVE) that runs from Madrid to Toledo. The train is faster than the bus, but you will spend a few more Euros. 1º Tip: Go by Bus! Buses around Spain are comfortable and reliable. If you have time, go by bus and save some money, then you can spend more on other stuff. And by the end of the day (after 8 hours of sightseeing) you can take a little nap on the bus. One hour of sleep and you are ready to enjoy the night in Madrid! I was super anxious to arrive in Toledo. Everything that I read about the city made my expectations grow a lot. For us, Brazilians, medieval towns are not common. Our country was “discovered” 500 years ago, so our architecture and history are pretty new. To visit cities like Toledo is a trip to the past, is like getting inside a history book. The bus station in Toledo is on the bottom of the city. We got out of the station and walked towards the walls and gates that we saw above the hill. It was a 20 minutes walk, but a really pleasant way. As soon as we arrived in the top I had a jaw dropping view. The Puerta Nova de Bisagra was there welcoming us. You get into the city by this beautiful gate and in a few minutes you are already lost. That’s true, we got lost in such a small town. After the big gate we followed the street on the left side, crossed the Puerta del Sol, and 5 minutes later we had no clue where we were. Toledo is one of the must-see cities in Spain, so we thought that there would be a tourism information office right in the entrance of the city, or in the center of the town. Turned out it didn’t. We walked a lot and we couldn’t find it. At least we were not alone, there were many people like us trying to find their way around the city. The problem was that we didn’t have a map and we didn’t want to wander all the day long guessing where the places were. To try to get some information we entered in an art gallery and ask where the tourism office was. The guy didn’t have a clue where it was, although he handed us a city map. Thank you very much, unknown man, you saved our day trip! Be smart and print a map, or at least save the map off-line in you mobile before traveling. It will make your life easier and you will save money: in some cities they charge up to 5€ for a simple city plan. We were really a fool to believe that the Google Maps would be working in my mobile. When we arrived there we couldn’t connect with 3G or GPS, so we had to find an old-fashioned but useful paper map. With the map in hands we started exploring the ancient Spanish capital. The amazing historical buildings, narrow streets that ended in nowhere, and the sweet smell of almonds that makes you feel hungry all the time. If you never heard or read about Toledo, here is a short, really short – resume about the history of this amazing city. Just for you to understand why it is an unmissable destination in Europe. There isn’t a right way to explore the city. We started by the Jesuits Church that we found in our way. After the Cathedral, it is the most beautiful church in the city, and it has an amazing view of Toledo from the bell tower. Beautiful architecture, the two big cloisters around and garden are awesome. By the small entrance door you can not imagine the beauty that is hidden inside. 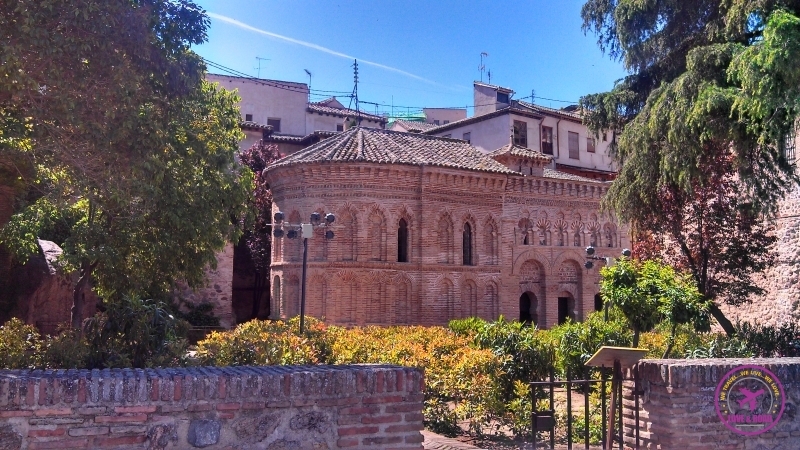 The oldest Synagogue in Toledo, dated from the 12th century and was turned into a catholic church in the 15th century. It was a mosque from the 9th century and turned into a church in 1159. Now they are doing some excavation in the underground and restoring the back of the church. A really ancient place, with a nice garden on the side. Walk through the garden till you reach the walls. Great view from the city and Puerta del Sol. While visiting these places be aware of the opening and closing time, some of the churches closed for lunch time. We were lucky, the attendant that received us in the Jesuits church was really helpful. He explained about the wristband, prices, timetables, locations, everything in a fluent English. Walking from one church to another you will find beautiful houses, tiny streets, and cute shops. Go slowly and give time to yourself to absorb all the information. That’s the right way to enjoy Toledo! Stop for a coffee and try the famous Marzipan, a sweet little cake made of sugar, almonds and honey. Delicious! Two or three are enough to give you some energy to keep discovering the city. Was first used by the Romans as a palace in the 3rd century. The castle was destroyed by wars and had to be rebuilt by the Spanish Kings. When we were there it was closed for renovations, so we didn’t have the chance to visit inside. It was built during the roman empire and after numerous wars it is still perfect. Its name comes from the Muslin influence during the medieval times. Another beautiful example of medieval architecture. The view you have while crossing it is amazing. And we save the best for the last. Our favorite site in this magnificent city is the Cathedral! Please reserve at least one hour to spend there. To get in you have to pay 8€ per person, the price includes the audio guide. You buy the ticket in the official shop besides the Cathedral. At the first moment I thought it was expensive, and the audio guide unnecessary, but as soon as I opened the door I realized the massive importance of this church and how beautiful it is. The money spent was totally worthy. I do recommend to follow the audio guide and go chapel by chapel, discovering the sacristy, the treasures and the cloister. The altars are amazing, full of frescos and details that tell us about God, Jesus and the human history. Mind blowing sculptures and paintings with strong and powerful meanings. I am not a religious person, but I got truly touched by the energy of this place. There are many important paintings and sculptures inside the church, names as Caravaggio, El Greco, Tiziano and Goya. Apart from the beauty of the building you also have an art museum to visit. Pay attention to the guide and learn a bit of spanish art too. These are the main sites of Toledo and we recommend a visit to them. There are other museums and churches that can be visited, but probably you will need more than one day in town. Toledo is a city to be explored, you have to walk around the streets and discover things. The day we were there was magical, the sunlight brought to the city a golden color. I don’t have words to describe it. We were so involved by the city that we gave up of having a lunch in a restaurant to stay in the Cathedral Square eating a sandwich. That wasn’t an option to save money, we did it because we wanted to contemplate this fairytale place. Do you like to visit historical cities? Have you visit Toledo, Spain? Toledo hadn’t been anywhere we were desperate to go to. Before we read this. Thanks for enlightening us. I´m so glad that you liked it! We spent about Euro 12 on transport from Madrid and more Euro 8 on attractions. More than 20 years from my last visit in this beautiful city, reading your post i feel that this will be one of my next destinations! Toledo is so beautiful. We went there 4 years ago. We were visiting Madrid and did a day trip to Toledo and we loved it. Since then, to everyone that visits Madrid, I also advise checking Toledo. On the side note, love for travel has also made me recently start a small travel blog. Hope you’ll find good tips as well. Absolutely! A day trip to Toledo is a must!